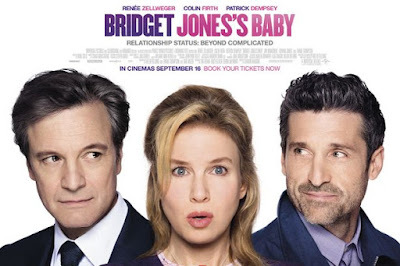 The eagerly awaited Bridget Jones’s Baby was released in UK cinemas on the 16th September 2016. I will begin by addressing the things I loved about the previous movies. The previous Bridget Jones films encompass many women’s struggles to lose weight, find the perfect guy and not only that just get through life. As an audience we may laugh at her struggles competing with the gym bunnies to tackle her weight woes, nightmares with her beauty regime and digging out the Spanx in order to look half decent in an outfit; though ultimately we empathise with her situation because her life is so relatable whether that be to our own lives or similarities between her situation and that of a friend. Through the years we have watched Bridget’s dilemma of which guy to choose, her heartbreak when things didn’t quite work out as expected, combined with her scattiness and vulnerability, which makes her endearing as a character. Bridget has finally reached her goal weight, which is inspiring yet her struggles were a big reason (no pun intended) as to why she was so relatable as a character. Notwithstanding, Bridget has found herself single once more and her struggles to fit in with her coupled up friends and find a date for an event is something which hasn’t changed in the latest film. One thing that has changed, Daniel Cleaver played by Hugh Grant is not in the film, which for me is probably the biggest reason why the film did not capture me as well as the previous films. I mean as much as we all love Mark Darcy, played by Colin Firth. I mean come on, have you seen Pride & Prejudice…he is gorgeous! Though, the character Mark Darcy is quite serious and at times stand-offish and the lack of appearance from Daniel Cleaver (played by Hugh Grant) takes away the light-hearted competitiveness between the two. Daniel Cleaver is the ultimate loveable rogue, who keeps Bridget grounded as well as on her toes at times when she doesn’t quite fit in with the snobby society surrounding Mark Darcy and the latest film doesn’t quite flow without him. In Cleaver’s place is the character Jack Qwant, played by the equally gorgeous Patrick Dempsey. Let me make it clear, whilst I wouldn’t throw Jack out of bed, after all he is a dreamboat…(that’s right I said it, dreamboat) like Darcy, he’s a good egg. Whilst there is a bit of competitiveness between the two men in Bridget’s life, it doesn’t quite match up to the Darcy/Cleaver fight to the chorus of ‘Raining Men’, let’s put it that way! Not only that, the film did not move me and in all honesty, despite the hard-nosed appearance of this post, for someone who cries during the break-up scene of Pretty Woman, which lasts less than two minutes, it doesn’t take much for me to empathise with characters! One character I loved in Bridget Jones’s Baby was the humourous gynaecologist, played by Emma Thompson who for me was the star of the film. I know a few of my friends were not as keen on the second film but I love Paul Nicholls as well as Hugh Grant and being a fan of the first two films, I was really looking forward to seeing the latest release. Whilst I was glad I went and had a fantastic evening with my work Grandma (Beryl), the lack of emotional engagement I had with the film made me feel a bit underwhelmed by Bridget Jones’s Baby and it is certainly not a film I will be buying once it’s released on DVD. Overall, die-hard Bridget fans should go and see the movie as in terms of my opinion of the film compared to my work colleagues, I am in the minority; though if you’re not fussed I would opt for another film. What did you make of Bridget Jones’s Baby? Whether you liked or loathed it, it would be great to hear from you.